Get ready to enter the fourth dimension, because this holiday weekend we're traveling all the way back to San Diego Comic-Con 1973 - a time when Vietnam was going strong, Watergate was still in the news and Led Zeppelin was setting records for concert attendance. That was when cosplayer Gary Ochs (his cosplayer group is KingCon Costumes) attended his first Comic-Con. He returned in 1991 and has been going ever since. Now he's going to give us his vivid account of what it was like to go to San Diego Comic-Con back before the convention center was even built. So come with me now to a Comic-Con whose 4-day badge cost $7.50, when you could find yourself eating lunch next to the Star Wars cast in the Sails Pavilion, and you could play an LP record of SDCC panels on your turntable. We even have actual scans of the 1973 SDCC program for your viewing pleasure. 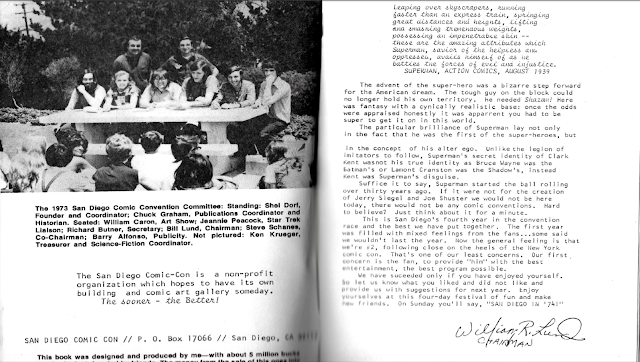 Gary, what inspired you to attend SDCC in 1973? We were living in Minnesota at the time and came out that August for a vacation to visit my parents. I discovered in the Escondido daily newspaper, the Times Advocate, that there was a comic convention in San Diego while we were there. Borrowing my folks' yellow Ford station wagon, I barreled down there for one day. I was able to walk right up to to the door, and purchase my badge for that day WITHOUT waiting in line. 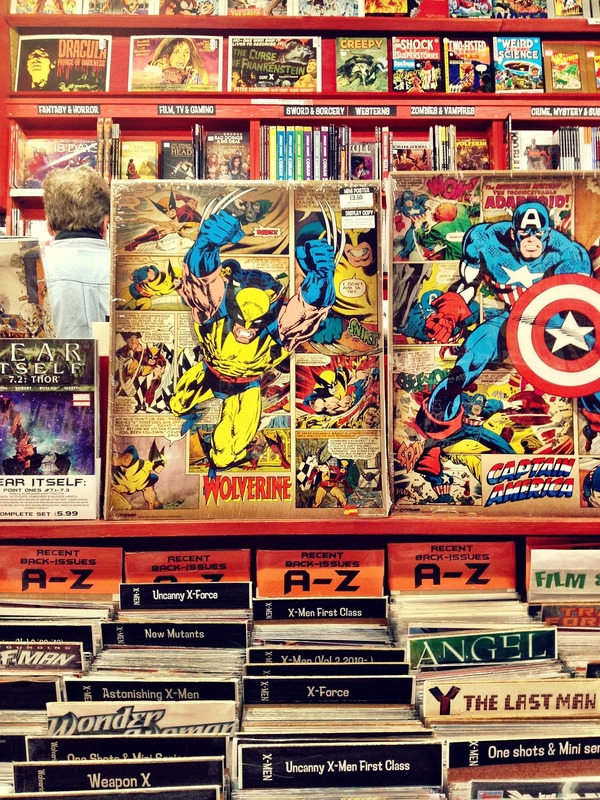 Although I had been collecting comics on and off ever since I was a kid in the 1950's, I never even knew that a comic convention of any type ever existed. It just sounded like a cool thing to do. The cost to get in for one day was $2.50. The four day badge was $7.50. At the Sheraton Hotel on Harbor Island, across from the airport. This was the only time it was ever held at the Sheraton. How many people were there? Rough estimate. I am going to guess that the attendence was under 500 people, but don't hold me exactly to that number. (Ed. note - Close. Wikipedia says 1K.) It was not crowded at all, and you could freely walk around the floor, and the panel attendance (to the ones I went to) was sparse. What did the "Dealers Floor" look like? What kind of things were sold? The dealers room was in one of the hotel ballrooms. It consisted of a formation of 3 x 6 tables arranged in a large rectangle. The dealers and/or artists were on the inside, sitting down and facing out. The attendees just roamed around the outside of the rectangle, gazing at the tables, visiting with the dealers or the artists. 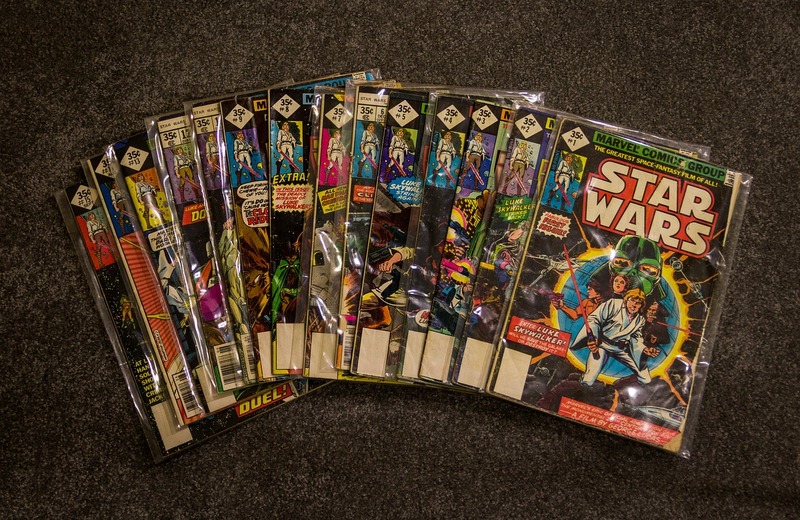 I know that older comics were there, because I purchased several. Couldn't tell you what they were, now. There were some artists there, and I did purchase a copy of a Savage Sword of Conan from Alfredo Alcala, who was one of the interior artists for that series. I couldn't believe that I actually met an artist, and got his autograph. There may have been other collectibles, but I am not sure. Mostly comics. What was your first panel and what was it like? I am pretty sure there were two panels that I attended. One was moderated by Roy Thomas, who was a prolific writer for Marvel Comics. He talked about upcoming projects. The other was a Hollywood panel promoting a movie that sadly, to my knowledge, was never released. It was to star Sybil Danning (a famous Hollywood B action star in the 70's) as a character known as Black Diamond. I believe she was a spy or cat burglar. Ms. Danning was actually there, and the audience was so amazed to see a famous person there. The room probably could have held 50 - 75 people, but it was only about half full. 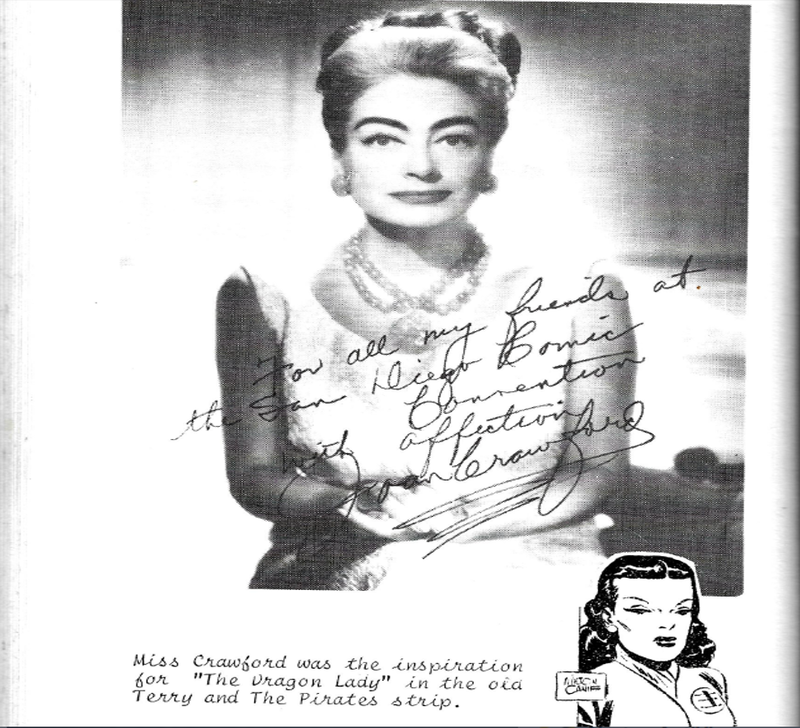 Several years ago, I met her at the Autograph area under the Sails at the Convention Center at Comic-Con, and actually got her autograph. She remembered her earlier appearance! On a day other than when I attended, I do know that Ray Bradbury was there for a panel. When you went back in 1991, what were the biggest differences? The type of attendees? The Exhibit Hall? The panels? There was such a night and day difference, going in 1991. Of course, I could say the same thing about what SDCCI has currently evolved into. 1991 was the first year the show was held, I believe, in the San Diego Convention Center. You just showed up in a line, waited about 20 minutes, and bought your badge for the day. The convention floor DID NOT take up the entire convention center. That didn't happen until later probably after 2000. The attendees in 1973 were mostly male, can't remember much of a family presence. And I do not remember any costumes. By 1991, there were both attendees of all ages and genders. Some families. But it still wasn't very crowded, and you could easily walk down the aisles of the convention floor space. There was much more variety in the dealers. Collectibles. Black market copies of video discs. Sword and knife dealers, air soft guns. Much larger variety of program panels. During the early 1990's, I would attend usually just on Saturdays, and I would try to sit in on at least one Marvel and one DC panel. 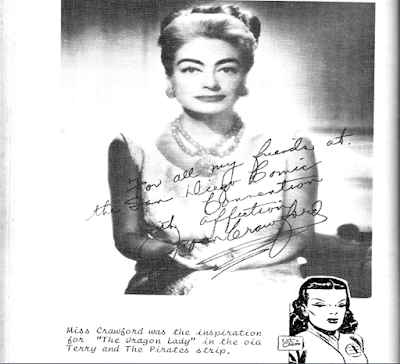 It was not uncommon for them to distribute copies of comics and/or posters for the attendees of their panels. It wasn't until after the year 2000 that I started going multiple days. And it was cool that you could walk up to a kiosk (waiting time 1 -2 minutes) and purchase your badge for the following year. Back in the 1990's, it never dawned on me that there were photo opportunities everywhere. Artists, writers, Hollywood stars and/or directors, cosplayers (although that term didn't evolve for years to come) were all there. One year, I was having lunch under the Sails area, and at the table next to me were a number of the Star Wars actors, including THE Luke Skywalker, Darth Vader, and Chewy. Mostly, they were just regular folks, clowning around and there was no pile up of attendees around them. Of course, no camera!!!! Back then we didn't have our cell phones to snap selfies every two seconds. Even digital cameras didn't exist in the 90's. There were some costumes out on the floor, but not like today. 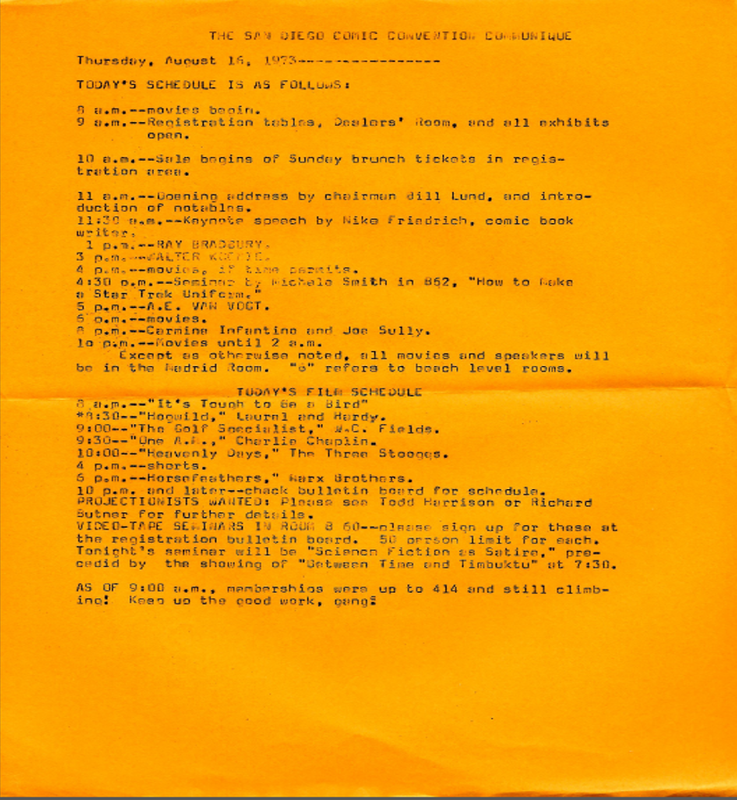 Thursday's program in 1973. Memberships were up to 414 by 9 am! What are the biggest changes you've noticed since 1991? Since 1991, the largest change is the difficulty in obtaining badges. I have been very fortunate to have gone continuously since 1991, but it hasn't always been easy. And of course the crowds. Going from maybe 10,000 people to over 130,000 is pretty intense. You used to be able to walk easily on the hall floor. Or in the lobby. Even on the sidewalk out in front of the convention center. And the Gaslamp District or spillage into the nearby hotels or even into Horton Plaza?? Nonexistent. And of course, the steady evolution of panels being dominated by Hollywood. It was so easy to get into the panel rooms. For many years, I would show up on Friday or Saturday morning at 6 AM, and I was one of the first 25 people in line. For many years, it was easy to be in the first 5 - 10 rows in either Ballroom 20 or later, Hall H. Now you practically have to camp out days in advance. 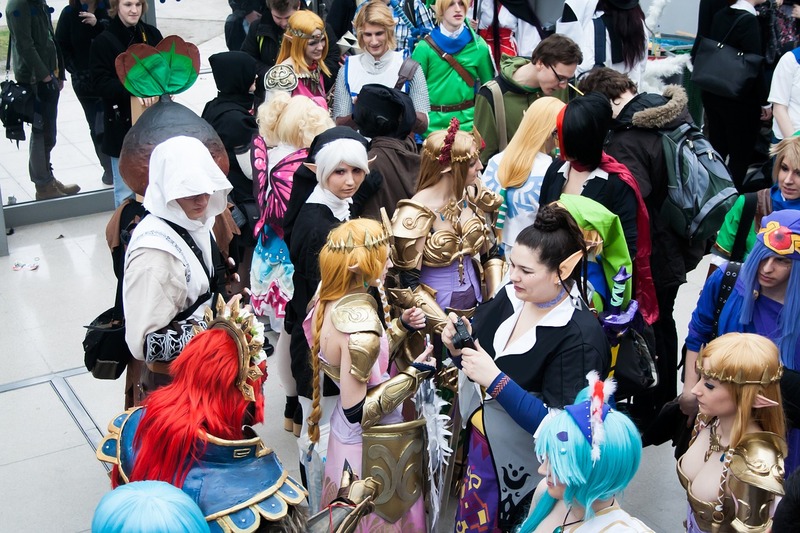 And the steady grow of Cosplay is pretty cool. My wife and I, along with several friends, have been doing Cosplay since 2005. We custom build our costumes, but the state of the art in the beginning was pretty primitive. Now, we see some very, very professional costumes that have taken people months and large sums of money. We have probably ourselves crafted over 35 costumes and have been lucky to have been in the San Diego Union Tribune three times over the years. What do you miss most about the old days? And what do you love most about the new days? I miss the ability to walk freely through the convention halls, going from one end to the other. Now it is very difficult to even make it through every aisle, from one end to the other. I also miss the ability to get into the Hall H panels so easily. And I miss the ease of purchasing badges. But I do love the diversity of the new days. The spillage into the Gaslamp District, the neighboring hotels, and and along the Harbor Drive. And the diversity of the Hollywood panels. There truly is something for everyone. Artist Alley has really grown. And I have made many friends with dealers in the Silver and Gold Age aisles that I have seen over the years. And I also enjoy the greater access to information, whether it is the evolving Facebook and Toucan blog sites of SDCCI, or the independent blogs like www.comicconguide.com. Also the phone apps are great. Any other thoughts or things that surprise today's attendees? Several thoughts. One, I wish the City of San Diego would increase its focus on enlarging the San Diego Convention Center. Instead of trying to build a football stadium that only gets used a handful of times a year, look at the amount of growth the city would enjoy with an enlarged convention center that can be used all year long. SDCCI has been trying out both Anaheim and now LA for WonderCon. Do we really think that is so innocent a use? They could have gone back to the San Francisco Moscone Center years ago. And it was a great location. If San Diego can't find room for the Comic-Con, I am afraid that it could leave San Diego. And I feel that to be a shame, because part of the growth and success of this show has been the great synergy with the city. 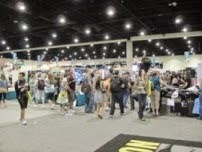 IF San Diego can't fit an expansion into their near term picture, it would be great if the SDCCI organizers might focus on perhaps hosting the show over multiple weekends. Or bring WonderCon as a four day event in the spring to San Diego. Why travel to Anaheim or LA? Although the show has evolved over the course of time, it still rings true to the evolving nature of the cultural arts. The show might never have achieved such growth and success, if it had only stayed true to the comic roots. And now people all over San Diego County know about Comic-Con. People that I would never have guessed are big fans of the show. Over the years, I have changed my tactics in enjoying the show. Since 2002, I have taken thousands of digital photos of the show. And hundreds of hours of video footage, many of the Hollywood panels. I have started working on a history of sorts of the SDCCI, including hundreds of articles and print media mentions of the convention. I have convention programs from the years I attended, but I have started working on filling the gaps. I just recently picked up a copy of the 1979 program. Now I only have 1970 and 1972 to complete my program collection. 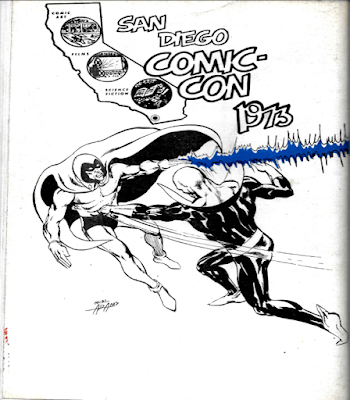 Oh, and did you know that in one of the very early years, there was a published (and no, I don't have it) LP recording of some of the panels at the Comic-Con? There actually is a link somewhere on the internet, that has a audio playback of the record. Amazing!! Amazing, indeed. Thanks for sharing your memories, Gary! It's fascinating to hear about how SDCC has changed over the years - and inspiring to know it's kept the same essential magic for more than 40 years. What a great interview! It's nice to hear how much CC has changed since the 70s and now since 1991. I was there in the early 1990s and remember how easy it was to walk around the convention center. In fact, I remember when they hand wrote your name on the badge! I agree that expanding the convention center would be better than having another stadium for the Chargers. Though I enjoy the Chargers, I feel CC has more of an economic impact on San Diego than a football team. 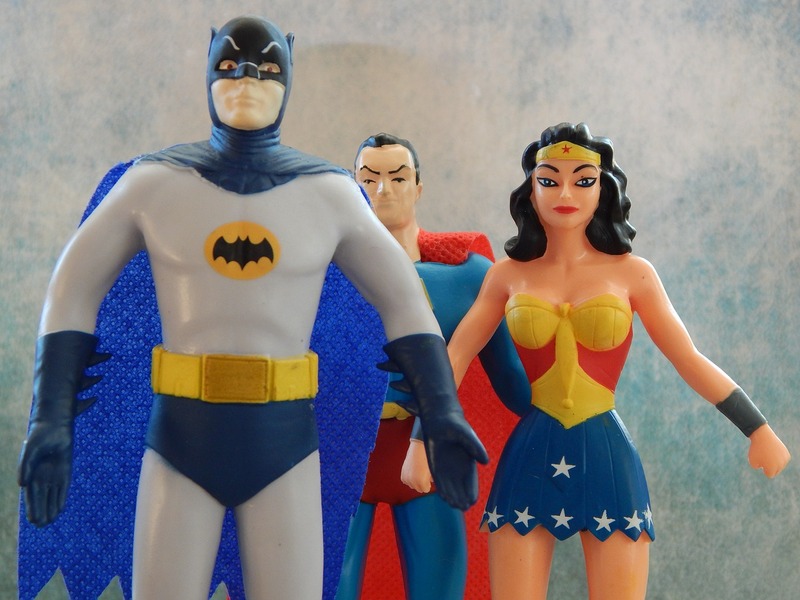 Also, CC is much more diverse, encompassing all sorts of people from all over the world from comic book collectors to star struck Hollywood fans and everything in between! But for me the best part is that 99% of the time most of the people I've met at CC through the years have been nothing best the nicest and least egocentric. No one cares if you're this way or that. For me, CC is one big crazy family and we get to hang around for those four days. SDCC attendees are the best. Not only does everyone tend to be easygoing and helpful, the conversations are always great. Everyone's interesting to talk to. It's hard for me to picture handwritten badges... How times have changed.